Part of the 2018 Arlington BioBlitz team. 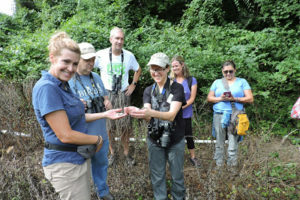 The second ever Arlington Bioblitz that took place on Sept. 15, 2018 had always been planned as a smaller and more focused event than the first one conducted last May. It was planned to be done at one park rather than several and over a shorter period of time. But it became an even smaller event when predicted stormy weather ahead of the day caused several team leaders to reconsider and less people to sign up. However, 38 people divided into several teams. Luckily, the weather held for us, and these folks tallied 762 observations of 362 different species, representing some interesting biodiversity for Glencarlyn Park, where all the activities took place. While some observations still need to be added and some identifications still need to be confirmed, we do have some initial numbers. 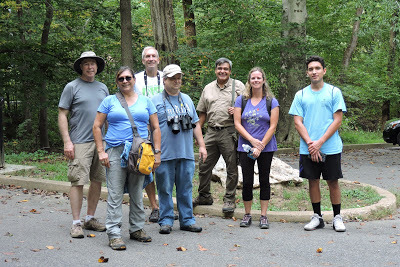 An early morning bird watching team saw 26 bird species, including some migrating warblers such as both Tennessee and Chestnut-Sided Warblers. Botany teams recorded 166 different plant species. While only two amphibians and 4 reptiles were seen, one was of a Ring-necked Snake under a snake board placed out there as habitat and to make surveys for wildlife easier. This snake is fairly uncommon in Arlington and had not been recorded in Glencarlyn Park before, so it was a very good find. Read more about the lead up to the Arlington BioBlitz and why these bioblitzes are conducted.